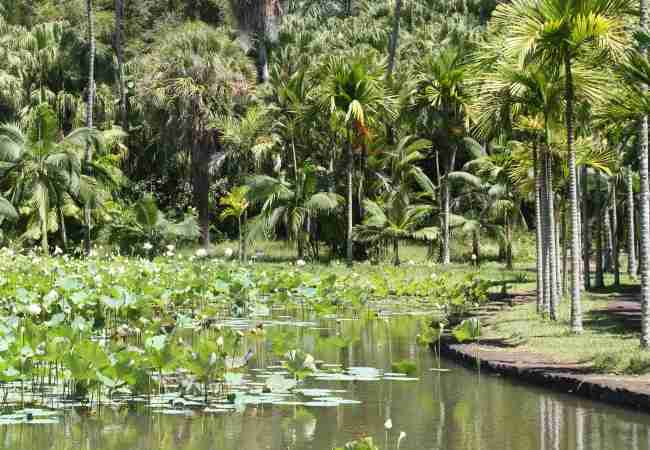 The botanical garden in Mauritius is a must-see attraction. 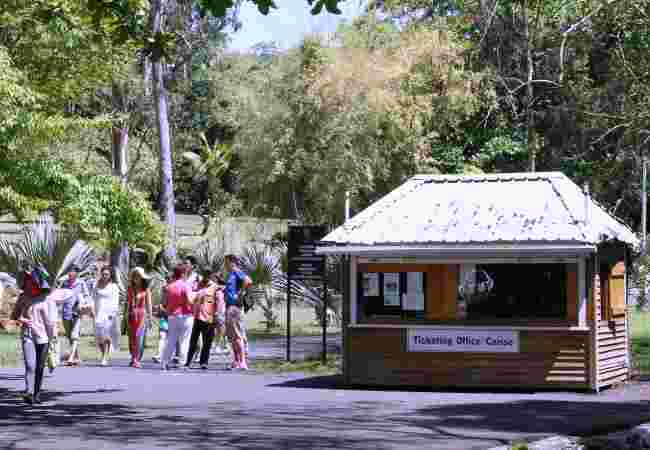 The best way to enjoy your visit is to hire a guide at the entrance. He'll show you fascinating tree species and share interesting stories. Spend at least a couple of hours exploring our exotic fauna and flora. You'll be mesmerized. Plan your sightseeing in the morning when the temperature is still delicious. Our botanical garden is home to the most beautiful botanical species in the world. This grand old lady will be 300 years old in 2029. Our pride and joy is the oldest botanical garden in the southern hemisphere. You’ll be blown away by the amazing collection of 85 types of palm trees. 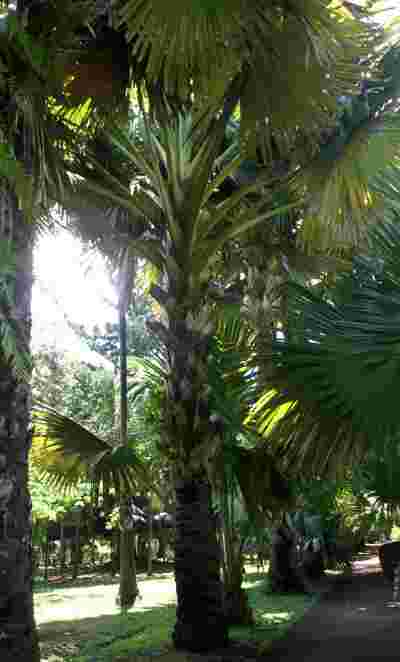 From bottle palms, royal palms to the talipot palm which blooms every 40 years or so and then dies! The sausage tree, the fish poison tree whose grounded seeds can stun and even kill a fish! Before you start your exploration here is a short story. The botanical garden was first a humble vegetable garden. 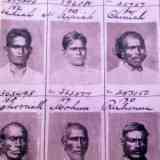 At the time our island was a French colony. 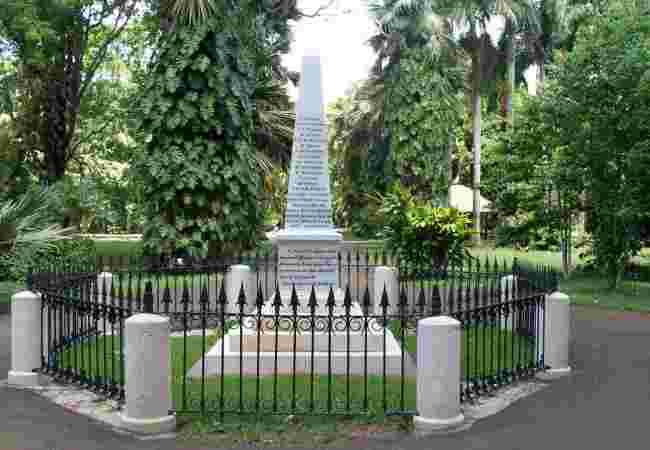 Governor Mahe de Labourdonnais started the garden in the 1720’s. Pamplemousses was a popular village and home to many slaves. They laboured in the sugar mill and tended to the garden. 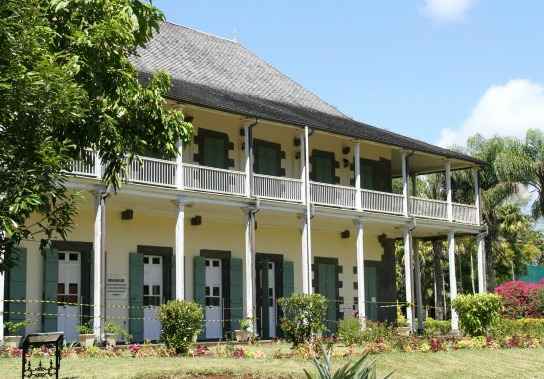 They also built the governor’s house ‘Mon Plaisir’ and a canal for irrigation. You can still see the Canal de la Villebague lined with cut stones. France wanted to end Dutch monopoly on spices during the reign of King Louis XV. His botanist Monsieur Pierre Poivre was to collect plants and seeds from all over the world. 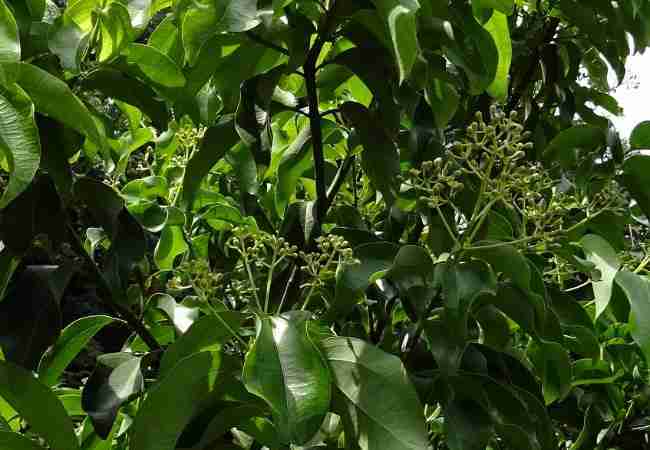 A fragrant spice garden with camphor, cinnamon, nutmeg, clove trees (to name a few). Frenchman Nicolas de Cere took over from Monsieur Poivre. During 40 years he set about designing and building alleys, ponds and benches. He is the one who introduced fish. The botanical garden in Mauritius was renamed Sir Seewoosagur Ramgoolam or SSR in 1988. Our beloved father of the nation was cremated in the garden. His ashes scattered in the holy river Ganges. See the lotus flower on top of the memorial or ‘Samadhi’ which means 'tomb' in Hindi? 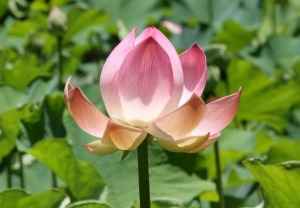 In Hinduism the lotus represents someone who is spiritual and wise. 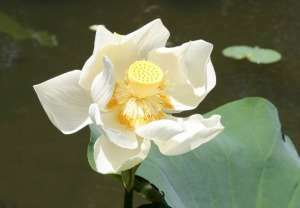 The lotus is also associated with beauty and eternity. Beloved Hindu gods and goddesses are depicted with a lotus flower. 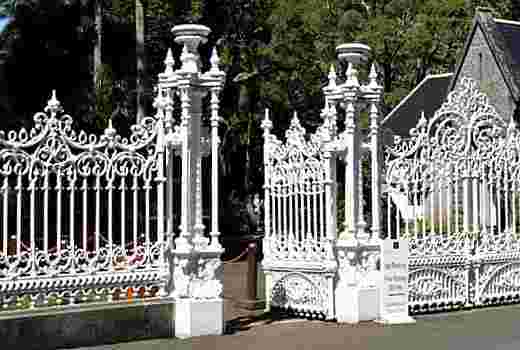 Let’s start at the grand entrance with the majestic wrought iron gates. They won the first prize at the International Exhibition at London's Crystal Palace in 1862. Once through the gates, go to the ticket office. For a handful of rupees you can hire a guide to visit the 37 hectare garden. One of the guides is wearing black trousers in the photo. The white marble colonne engraved with the names of people who have contributed to our flora and fauna. There is an inspiring quotation from Bernardin de Saint Pierre: ‘the gift of a small plant is more precious to me than the discovery of a gold mine and a longer lasting monument than a pyramid’. Ask your guide to show you where Nelson Mandela, Indira Gandhi, Francois Mitterrand and British royals have planted trees. 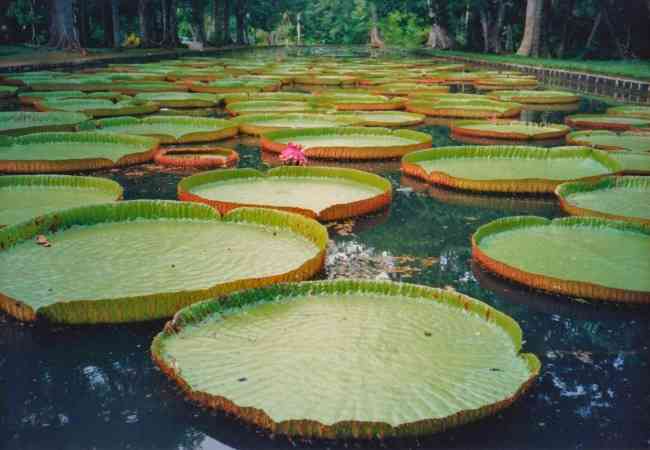 The famous giant waterlilies ‘Victoria Amazonica’ were discovered by a German horticulturist in Amazonia. He dedicated them to Queen Victoria. 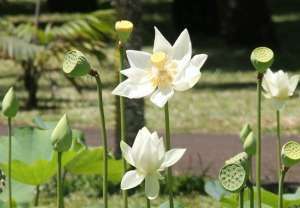 They were later introduced to the botanical garden in Mauritius by the director a Mr O’connor in 1927. Their diameter can reach 3 meters! 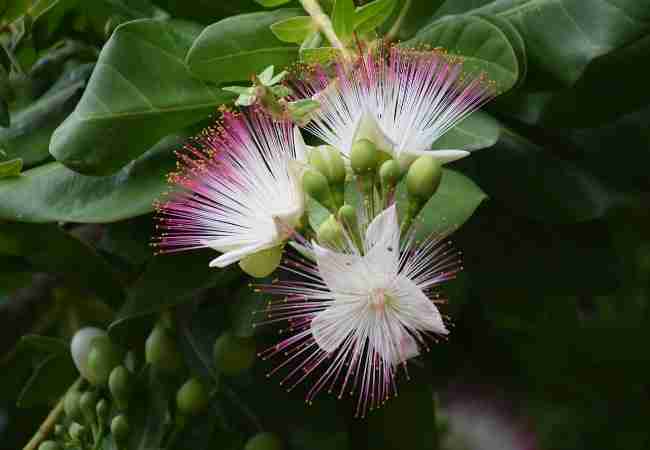 They give birth to a white flower which turns pink/violet the following day. The flower sinks to the bottom of the pond on the third day. 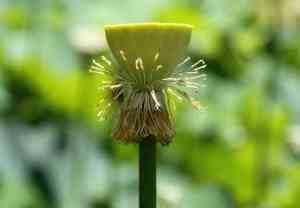 It will develop into a seed capsule containing about 500 seeds. Le 'new' chateau Mon Plaisir was built by the British in 1823 to house the garden’s intendant. It was also used as a quarantine during the cholera epidemic a few years later. 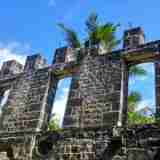 The ‘castle’ appears to have been built on the spot where the French governor Mahe de Labourdonnais had his home. 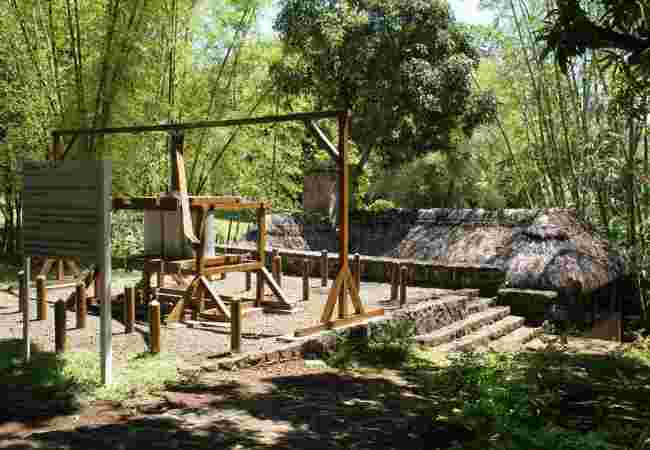 A replica right in the botanical garden of Mauritius! Sugarcane was inserted between the white vertical cylinders you see on the left. These were drawn by oxen walking in a circle. 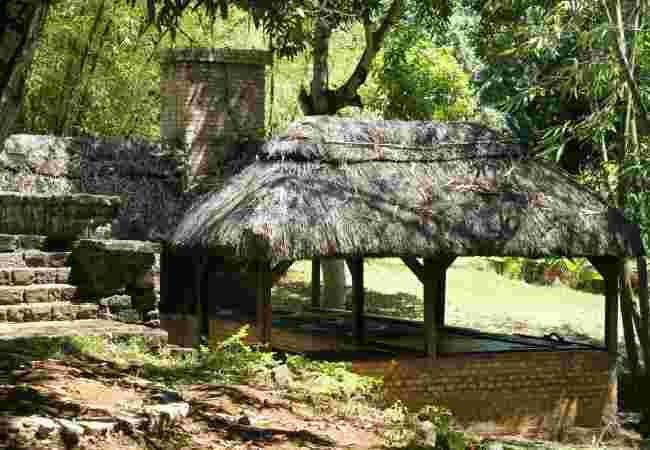 The cane juice was then carried to a set of five cauldrons located under the straw roof, filtered, cooked to a caramel consistency and set into molds made of wood. 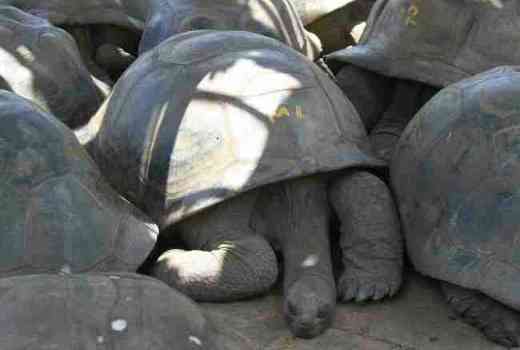 Most of the Mascarene Island’s tortoises are cousins so their ancestors are a little difficult to trace. They possibly hail from Aldabra which is a small coral atoll off the coast of Tanzania. 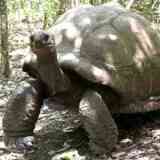 By the start of the 19th century most of the Indian Ocean’s giant tortoises were virtually extinct. These giant tortoises can cross oceans by riding waves like a raft and stay adrift for weeks! 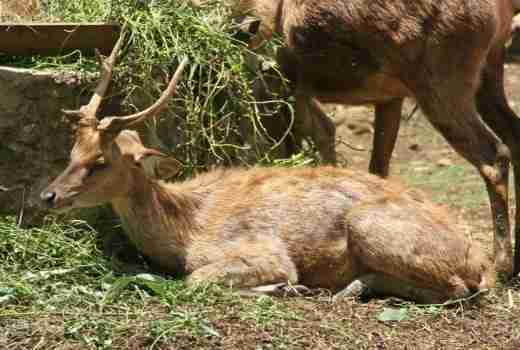 The deers were introduced by the Dutch. 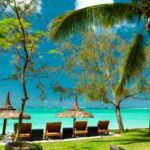 The Mauritius botanical garden is about 10 km North East of Port Louis and a 15 minute drive from the North coast. It's well signposted off the highway. 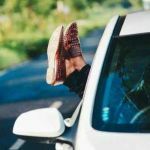 Parking in the official car park is free. Ignore the welcoming hand gestures of ‘parking attendants’ who will promptly direct you elsewhere for a fee. Entrance fee: 200 rupees for non-residents. 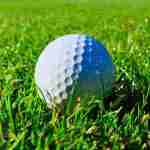 You can hire a golf-buggy to tour the garden if you have limited mobility. 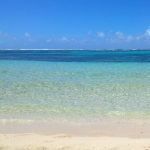 Enough said, I now leave you to further explore the Mauritius botanical garden with your friendly guide. 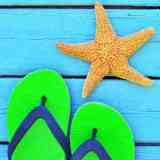 Enjoy your excursion!